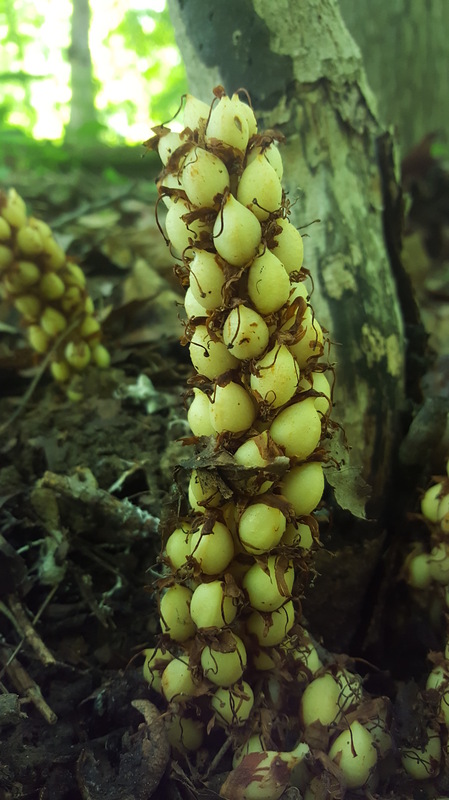 During my summer hikes, I have come across a few different wildflowers that are non-photosynthesizing, meaning that they do not have the ability to convert light energy into food. 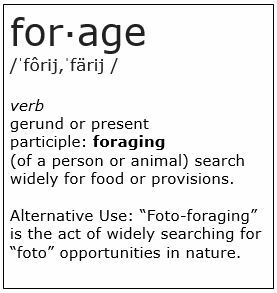 They need to get their food from another source. 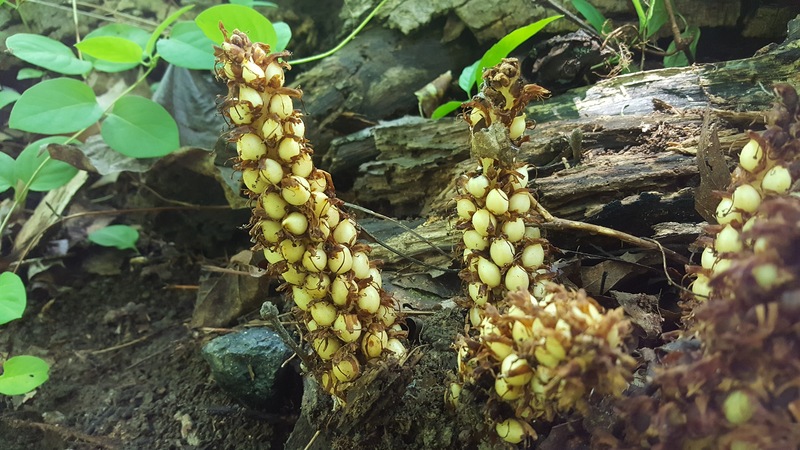 There is one plant genus that gets its food directly by tapping into the root systems of oak and beech trees and steals the food from the trees. 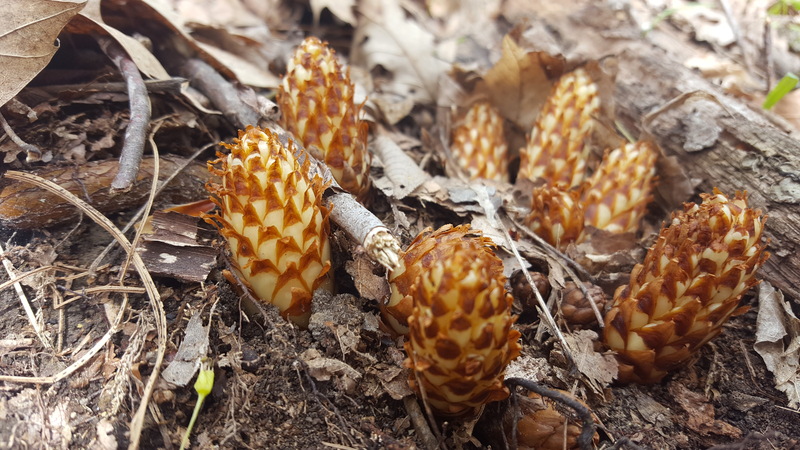 This perennial is called Bear Corn or Conopholis americana. 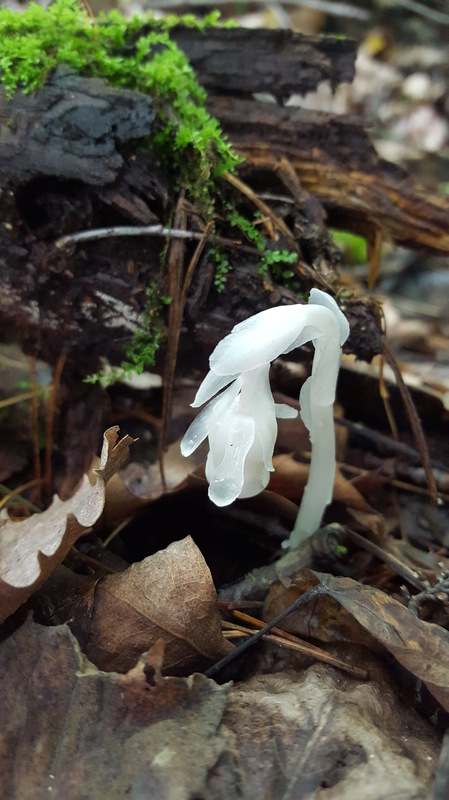 Here are photos of a few that I have found in Pennsylvania. 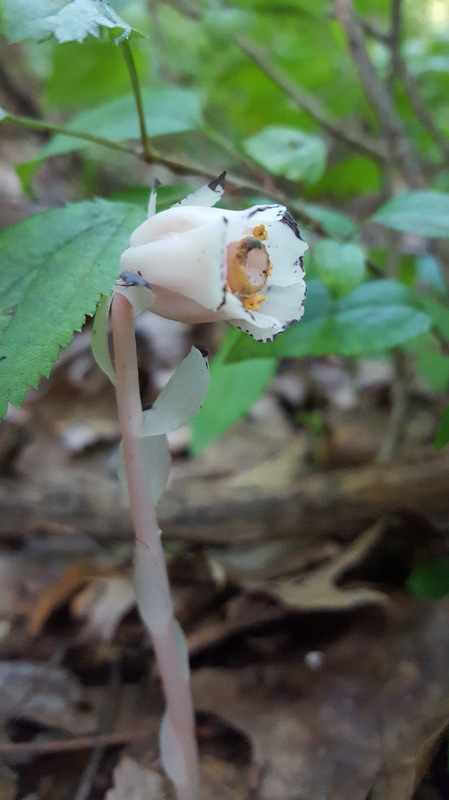 Another plant genus takes it one step further and is parasitic to a mushroom (Russula sp.) 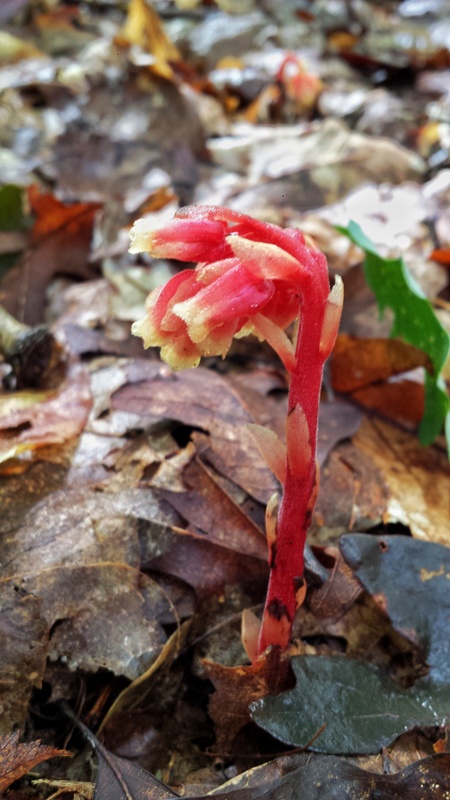 which has a symbiotic relationship with a tree (frequently oak and beech trees as well). This relationship is referred to as Myco-heterotrophy. 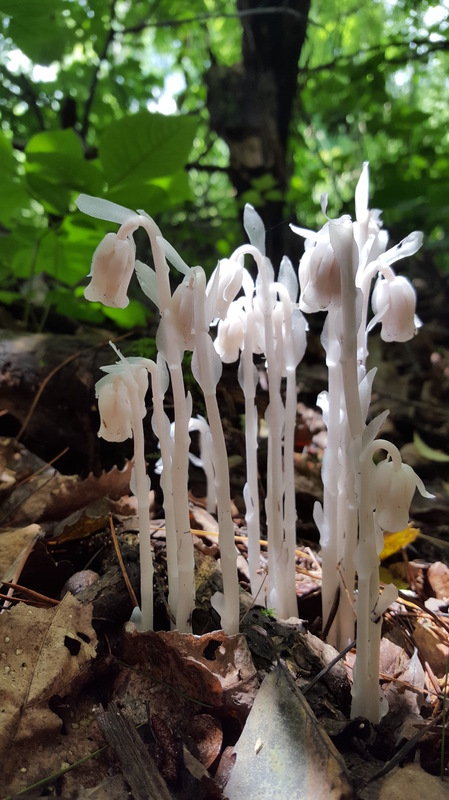 This plant comes in different forms including Monotropa uniflora (also called ghost plant/ghost pipe, or Indian pipe) which is white and only has one flower per stem and Monotropa hypopitys (also called Dutchman’s pipe, false beech-drops, or pinesap) which is widely variable in its appearance with multiple flowers per stem and varying shades of yellow and pink. 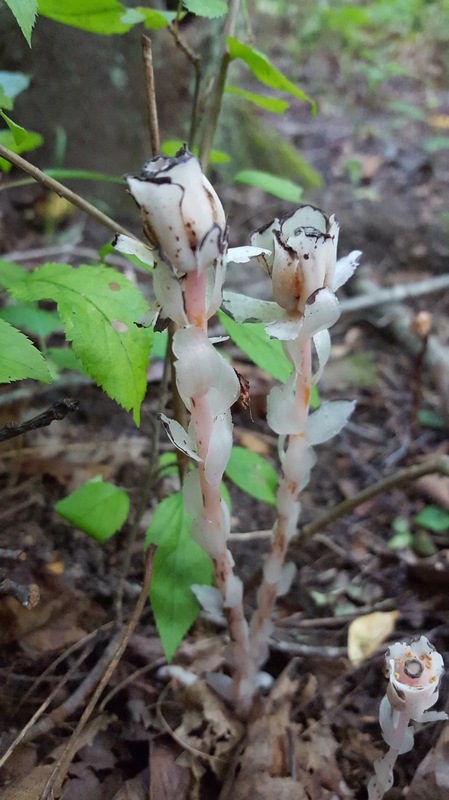 This color variation depends on the time of year as well as the soil conditions. 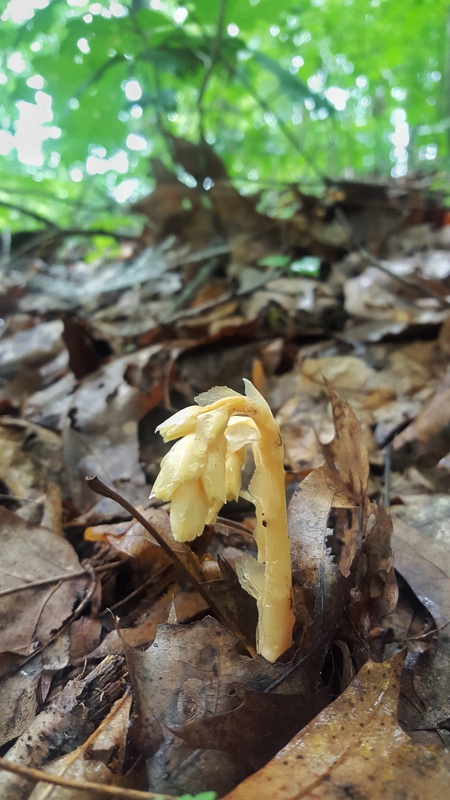 Update: Some experts have begun calling this plant Hypopitys monotropa, but that name is still considered synonymous rather than being broadly accepted as the correct name. 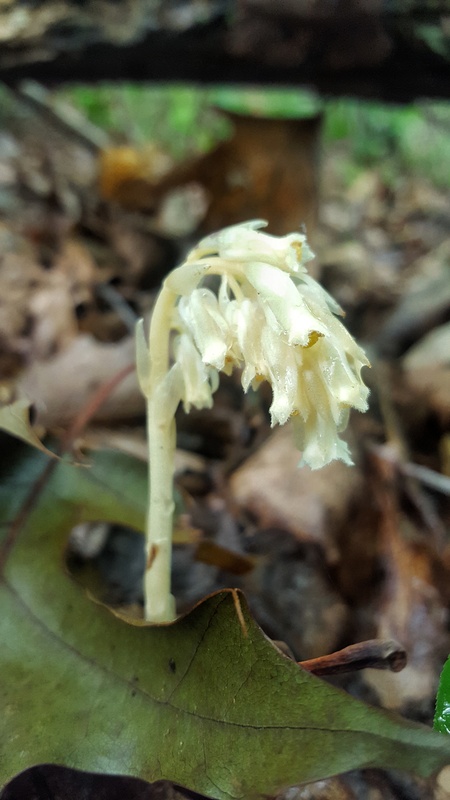 Here are photos of a few that I have found in South Western Pennsylvania. 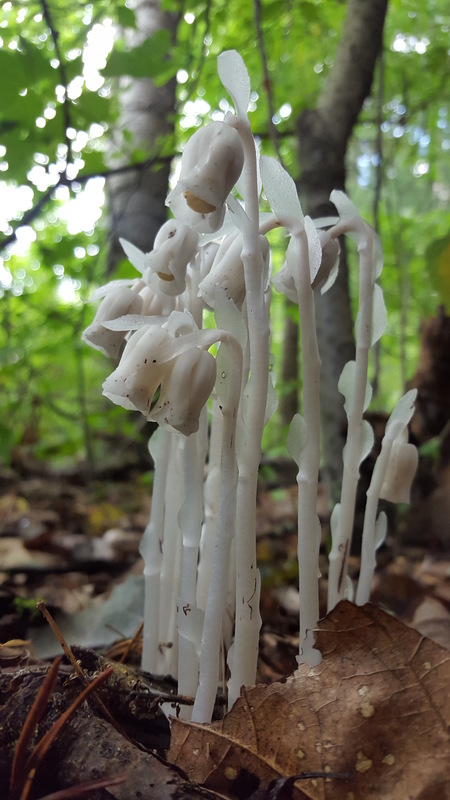 These are the white Monotropa uniflora. 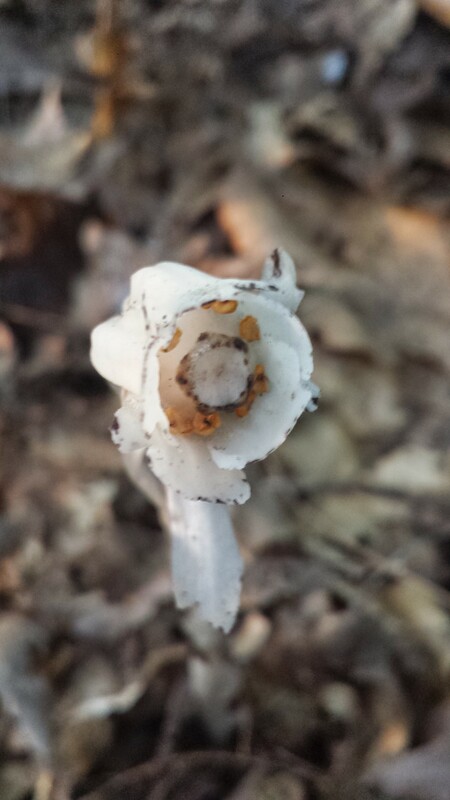 You will notice that each stem only has one flower. 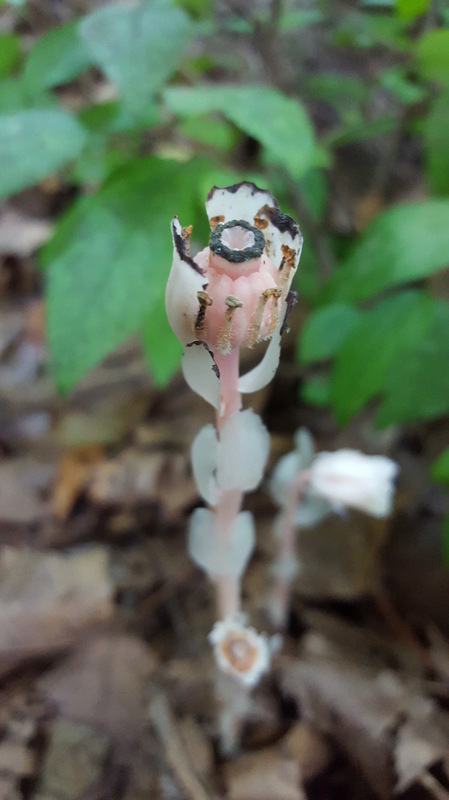 Additional Update: It appears that there are color variations for Monotropa uniflora. 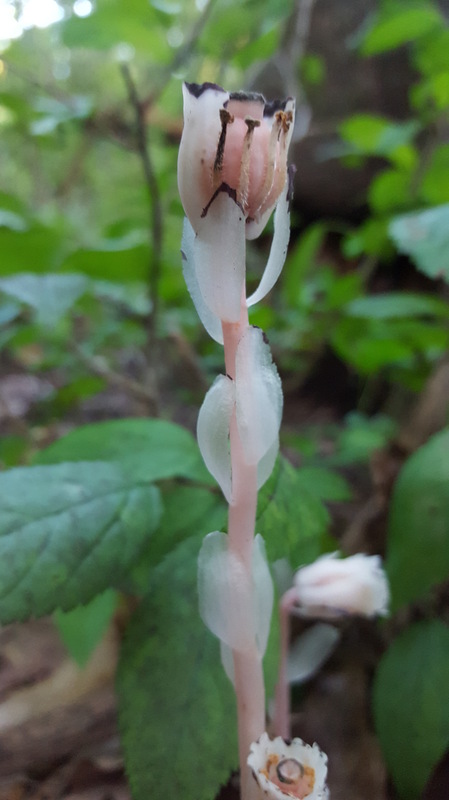 After I made this post, I found this pink variety. 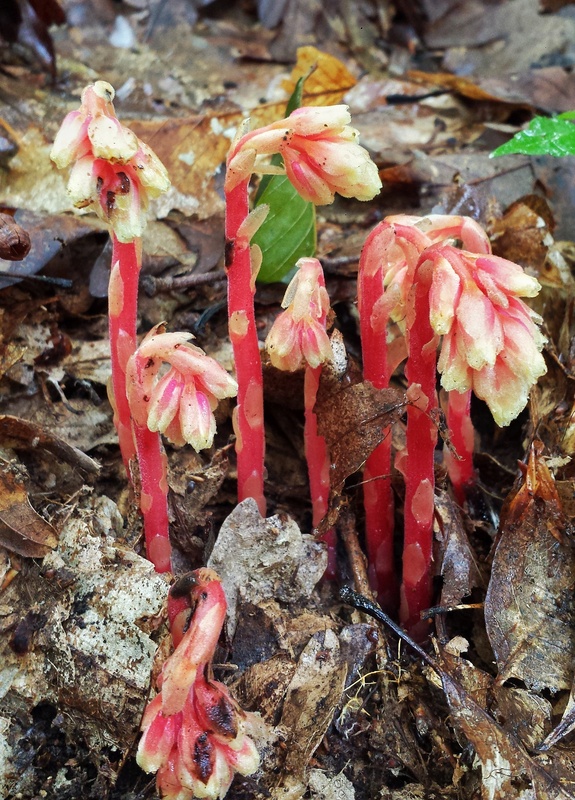 Here are a few photos of Monotropa hypopitys (the red/pink variety) that I found in Bradys Run Park. 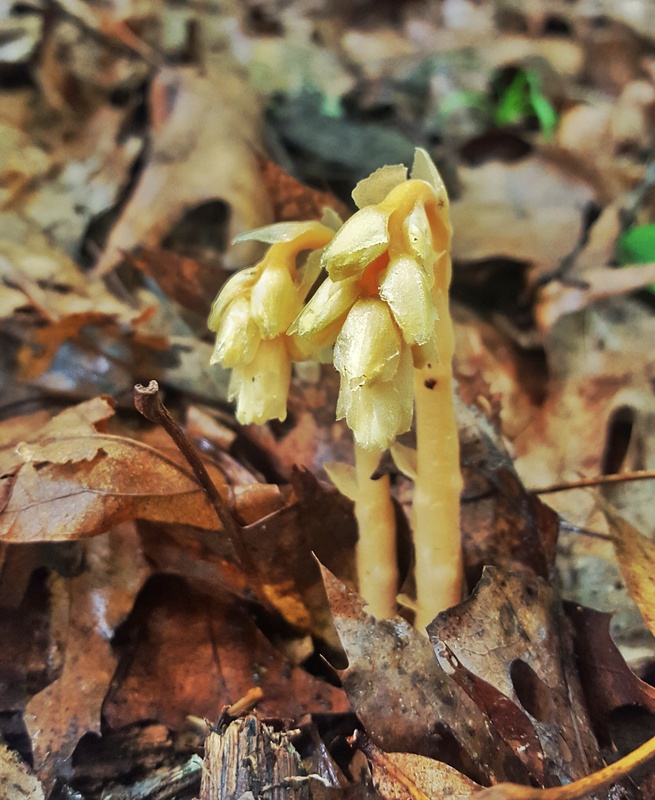 The most recent Monotropa hypopitys that I found were the yellow variety in Mingo Creek County Park.